Every woman loves a good highlighter on her face. It doesn’t matter if it is a subtle or extreme edition, this is possibly a must-have item in your everyday makeup routine. If you are a makeup lover, and a highlighter hoarder, you can learn how to apply highlighter the right way in just a few simple steps! A highlighter is a makeup item that attracts light on your face. It can also create an illusion and can give you a well-lifted look. 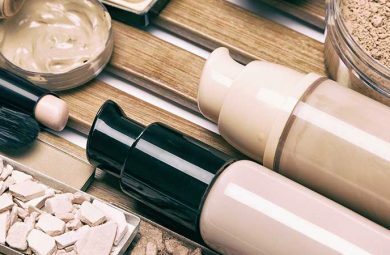 Finding the right shade for your skin tone is easy since makeup companies are coming out with many different shades, formulas, textures, and finishes. Highlighters have become very popular, and everyone can, with ease, find their appropriate shade. The only test that you should do when purchasing your shade is silver vs. gold. This means that you need to adjust your highlighter to your complexion. If you find yourself wearing golden or copper jewelry a lot, this means that you look the best with a warm and golden sun-kissed highlighting shade. However, if silver or platinum look the best on you, make sure you purchase a highlighter that has a lot of silver or pink tones in it. This is, also, not that hard since everyone looks good with a little bit of a highlight. If it is your big night out you should always apply a hefty amount. On the other hand, if you are a subtle makeup girl make sure you use a smaller amount. Add some shine only on some of your features such as your eyebrows and the tip of your nose. Also, incorporate your highlighting shades with your jewelry, as previously explained. Using your fingers will leave you with a natural outcome. 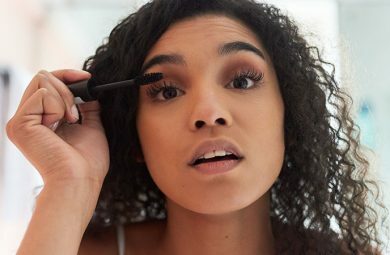 Working with a synthetic makeup brush will pack on the product. 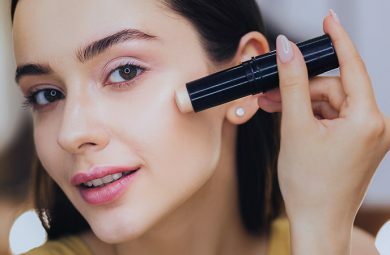 Applying highlighter with a beauty blender will leave you looking radiant and dewy and should be used only if you are applying liquid highlighters or creams. 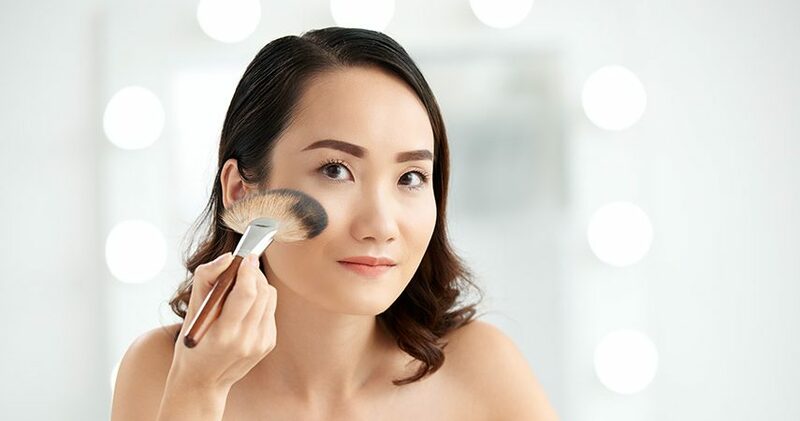 If you are using it over your cheeks, use a flat and angled brush. If you are applying it to smaller areas, use a dense blending brush. The highlighter can make you look young, youthful, and breathtaking. If you apply it properly, you will look sun-kissed and natural. However, too much of a highlighter can always make you look sweaty instead of glowy, so keep that in mind. This is, mostly, a hydrating and moisturizing product that comes in a bottle packaging. When applying it, only take a couple of drops onto your beauty blender and bounce it into the skin. Dewy highlighters are often very shimmery and glowy. If you prefer a subtle and matte looking face, you should use highlighting sticks. These highlighters are often quite subtle and easy to blend. However, if you are not a fan of a highlighter, you can always brighten up your face with some concealer and a brightening powder. This way you will have that matte effect. A shimmery highlighter is the one that comes in a powder form. It is a light and finely milled dust that you can apply over your creamy products. The shimmer will look the best once applied with a fan brush. Also, you should set your face with some Mac Fix+ or any setting spray. 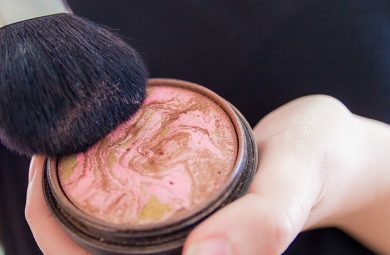 This way you will melt the powders into the skin and make the highlighter pop. Women love to apply highlighter on their cheeks. This is the most common placement as well. Make sure you apply it over your cheekbones and draw it to your forehead or your ears. It is best to use a fan brush since it does ”hug” this corner of your face the best. Everyone loves a bright inner corner. You should apply your shade with either your fingers or by using a small rounded brush. This little trick will make you look well rested and will give you a lifted bright effect. If you want to define your brows make sure you fill them in properly. After you are done, you can use a highlighter under your brow arch in order to bring some dimension and a pop of a glow. A highlighted nose will look a lot smaller and sharper. You can apply the glow down your nose or only at the tip. This is optional and based on your nose shape, as well as your preferences. Women love applying the highlighter down the bridge of their nose since it looks a lot slimmer and narrower. Cupid’s bow is when you highlight a little above your upper lip. You should apply some shimmer with your fingers in order to bring shine and make your lips appear fuller. Don’t go too heavy with the product since it can make your lips look sweaty.